Frontenac is found in Quebec City. If you're planning a trip to Québec, you'll want to make sure not to miss the famous sites in Québec. As one of the oldest cities in North America, Québec City and environs, offer quite a bit of history. There is lots to discover in this North American gem. 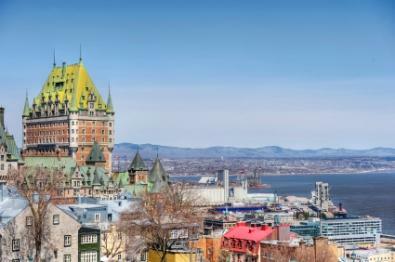 Québec has the distinguished honor of being a major trading post for furs, a landing ground for the likes of French explorers Jacques Cartier as well as Samuel Champlain, as well as being the location of the first settlements in what was once known as "New France." Rich with history but with plenty of newer attractions too--Québec makes a phenomenally interesting destination. This building hosts the National Assembly. It was built to mimic the Louvre and at the door you can see the inscription Je me souviens which is Québec's motto. While there are guided tours during the day, and activities for during the summer for families with children, it is the view during the evening that is most worth seeing. The massive structure is lit and apparently is quite the site. You can visit the National Assembly almost any time during the year, but call ahead to ask about a schedule of activities. The Citadelle serves many functions in Québec. It is a military installment, and part of the "Fortifications de Québec", and as such is one of the highest points in Québec. It also serves as the residence of the General Governor of Canada. Although the Citadelle is an active military garrison, there are still guided tours available on most days every hour on the hour. You can also tour the governor's residence. During the summer, you can see the changing of the guard ceremony. La Place-Royale is a central hub during the Winter Carnival. Managed by the Musée de la civilisation, the Place Royale is layered with cute buildings an cobble stone streets. One could easily spend a relaxed day roaming la Place Royale. The falls boast a height 27 meters taller than Niagara falls. However, unlike Niagara falls it is relatively unknown to the rest of the world. The park offers a variety of family friendly activities--particularly in the summer when the weather is less harsh. This museum is impressive and worth the seeing for a variety of reasons. In particular it is known for innovation, and as being the seat of knowledge within the city. However, it is also located in the heart of historic Québec City and therefore, if you are visiting the city anyways--this cultural icon is well worth the effort. Old Québec is actually more of a neighborhood than it is a site; however, if you're spending time in the capital city, you may as well walk in that direction. If you are visiting the Citadelle, you are already in Old Québec although there is lots more to see. Take a walking tour through the winding streets. It is here that you will find some of the oldest buildings in America. If you are looking for more information on visiting Québec or you want to know what famous sites in Québec are really worth your time, make sure to write to the Québec Tourism Board to request more information. You'll be glad you did!